Stag Building Solutions is a construction business. They work with commercial as well as residential spaces. 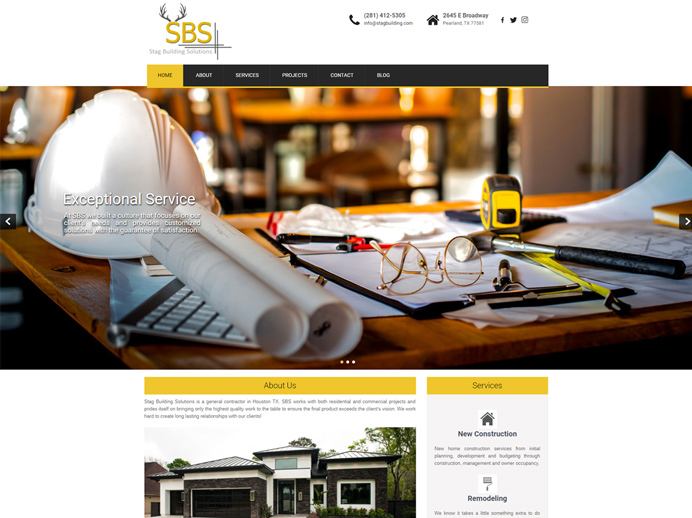 SBS also providing other building services like roofing, home repair, remodeling and more. The owners have years of experiences in general constructing and they focus on clear communication with their customers to make sure they bring their vision to reality. First challenge in this web design project was to create a modern but simple logo to represent a newly created brand. The other challenge was to make sure the site has a modern touch and differentiates the business from its competition. Stag Building Solutions have multiple development projects, both small and large, so it was important to showcase their portfolio and their work. We also had to make sure website users are taking an action on the website and contact a small business or request a quote. Our goal was to make sure the site was user-friendly and content management strategy consists of the simple and easy language for users. As a new brand it was important for the owners to have their vision implemented in their brand identity, logo design and style throughout the WordPress website. We made sure this construction company stands out from the rest and has a simple yet stylish website design. In this web design project we also focused on search engine optimization making sure a new company got all the strategy implemented in their website to help ranking high on google. We added a lot of local seo to make sure this business is listed on Google maps and the information is correct on all local business listings. At aStash we provide Fort Collins website design and development services. We have years of experience in internet marketing and search engine optimization. Whether you need a custom web design, content management, social media marketing or seo services, we can help! See more about our wordpress web design Fort Collins services, check out our website design pricing, and see our online marketing & WordPress maintenance packages. Northern Colorado seo website web development agency, design services Fort Collins, CO, digital marketing agency, Colorado search engine optimization company Loveland, Denver, Greely, Windsor, Wellington, Boulder, and other areas.